I thought it’d be fun to put together a list of my favourite places to eat in Cardiff, for people who’ve never been, or haven’t visited for a long time. If anywhere is missing from here it’s probably because I haven’t eaten there yet (an idea for another list, perhaps!). I’ve split it into two posts, the Independents and the Chains, altho I have fairly loose rules for what constitutes a chain! Situated in a former bank vault, The Potted Pig is my all-time favourite place to eat in Cardiff. Not only is the food delicious, but the lunch menu is reasonable, the Sunday roast is out of this world and they have 21 different types of gin behind the bar. Sold. Best for: Sunday lunch or a boozy lunch meeting. My second favourite place to eat in Cardiff – Riverside restaurant is just outside the city centre (in Riverside, funnily enough) but it’s only a 7 minute walk from the train station, so still a reasonable place to grab lunch if you’re in town. Riverside is a Chinese restaurant but the magic lies in their Dim Sum menu, so make sure you visit between 12-5pm to partake. This is where we eat with Q’s dad when he comes over from Macau. If that’s not a good enough recommendation I don’t know what is! Best for: Eating so much dim sim you have to roll yourself home, while still getting change from a twenty. Nestled in the High Street Arcade, the New York Deli is practically a Cardiff institution. Giant hoagies (a soft baguette to you and me) filled with all manner of fun like salt beef, pickles and swiss cheese (the Rueben is my favourite in case you haven’t guessed), you can also get salads, soups and bagels if you want something a little less gut busting. The menu is diverse and flexible, so don’t be afraid to substitute or go completely off piste. Their Christmas bagel is particularly amazing and, best of all, the sell Snapple. Hurrah! Wally’s is great for buying lots of strange, intriguing foreign foods that you want but don’t necessarily need. If that sounds like a negative, it’s not – I love all of their products with a (perhaps) slightly unhealthy obsession with their chorizo. Mm. They also have a coffee house, tucked away up the stairs where the breakfasts are filling but light. There’s a slant towards Austrian food and it’s great, so if you’re a fan of sausage (watch it) then I’d really suggest you give it a try one day. Their hot chocolate is also top notch. Best for: A lazy breakfast, people watching over the Royal Arcade. The Corner House is one of those places that we don’t eat at often, but when we do it’s good. It used to be our local of sorts before we moved house, and we’d often stop in with friends to grab a drink or two – they have a nice cocktails list and offer mulled cider in the winter, a Mia fave. Their menu has moved more towards upmarket British classics recently, which is a move I wholeheartedly approve of, although steer clear of the deep fried halloumi, Sarah wasn’t a fan! Best for: Drinks that turn into dinner that turns into ordering two puddings each. Cafe Citta is a firm favourite with my (half-Italian) boss, so I’m surprised that it took me so long to eat there. In fairness, we’d tried a couple of times before only to be turned away at the door – Cafe Citta is really, really tiny so try and go at a quiet time or book ahead if possible. The food is delicious without being pretentious – hearty Italian fair (you’ll find all the usual pizzas and pastas here) but far, far better than anything Pizza Express and Prezzo have to offer. Surprisingly, there’s also some quite decent food for gluten free eaters like myself – I had the aubergine bake and it was amazing. Best for: Cosy, authentic Italian food. If you live in Cardiff, love cheese and haven’t been to Madam Fromage yet then I really don’t know what to do with you. Tucked inside Castle Arcade, they have a wonderful cheese counter full to the brim with local and international offerings. They also have a tiny cafe, where you can orders platters of their beautiful cheeses. Do this often, they are delicious. Best for: Indulging your love of weird cheeses. Pen Y Lan Pantry is situated a couple of miles outside Cardiff City centre, but is on plenty of bus routes so don’t be afraid to go exploring for it one day. They offer a great selection of artisanal cheeses and meats, with homemade cakes and pies thrown in for good measure. It’s quite a small venue, but it’s full of charm and they even have a small shop section if you’re feeling inclined to recreate their goodies at home. Best for: A quiet brunch when you’re tired of the city. Y Mochyn Du is another one that’s a little bit outside the city centre but don’t let that put you off. It’s a bilingual pub, with Welsh speaking staff and menus so it’s a great place to go if you want to practice your Cymraeg! 🙂 Their food is also delicious, especially the Sunday roast. Trust. Best for: Practising your Welsh while stuffing your face. 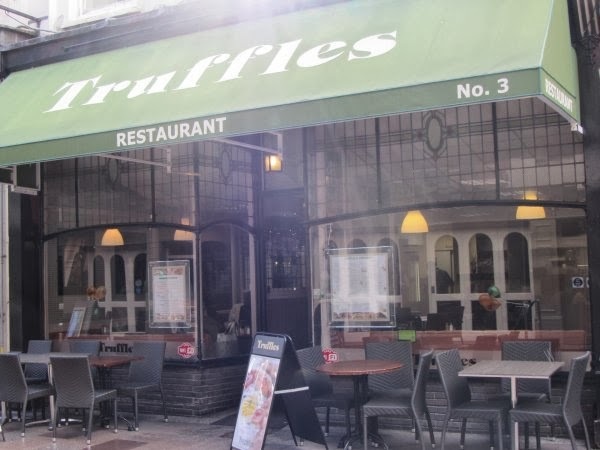 Truffles is one of those places that seems to have been in Cardiff since the dawn of time (in reality it’s been around since the 80s I think) and it doesn’t seem to have changed much since it was first opened. I like that tho – there is something wildly comforting about the lack of pretension at Truffles. The menu is honest and traditional, their roast is another one to seek out if you’re visiting / hungover (or both). It doesn’t look like much from the outside but it’ll be worth it, trust me. Best for: Time travelling to the 80s (in a good way). This post ended up way longer than I expected, ha. Look out for the 2nd part in the next few days, featuring the so called ‘chains’ of Cardiff. They’re still good, I promise.